Be the first to know about what’s happening at Kara Carrero Consulting! My main focus is learning to work smart and not hard. But in general, if you’re interested in improving your SEO, running and optimizing your social media and marketing skills, and various other digital marketing skills, sign up for the newsletter. As a thank you for subscribing, I am offering an exclusive subscriber freebie to help you with newsletter and social media marketing. 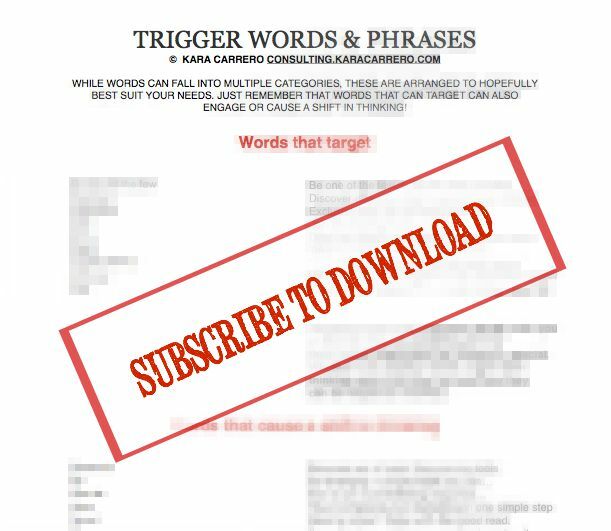 I have compiled my favorite 50 trigger words by type with examples and a brief explanation of how and why to use them. It’s three pages that are like a cheat sheet to sending out more meaningful tweets, forming better headlines, and generating more engaging newsletter subjects. I am so thankful I subscribed. Not only is the cheat sheet a quick reference for writing my email headlines and tweets, but I love getting links to the in-depth tutorials Kara provides on her website. They always help me build my site and I have confidence knowing I can do these things on my own because of the step-by-step instructions.